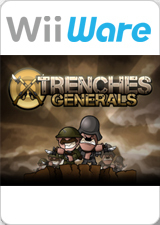 Trenches Generals - Trenches deploys to the Wii and is taking no hostages. Trenches has been designed for the Wii from the ground up for an immersive and engaging experience and provides a twist on the tried and true castle defense genre with its own personal style. Command Royal British Expeditionary Forces as the defender of the free world. Your troops must take to the field and defend your bunker from being overrun and use the Trenches located on the battlefield to hold their ground in between no mans land. Lead rifleman, mortarmen, snipers, machinegunners, and more against the enemies in the east! Choose your perks to customize how you play the single-player campaign or join with a friend for splitscreen cooperative and competitive multiplayer! Your war, your way! The graph below charts the compatibility with Trenches Generals since Dolphin's 2.0 release, listing revisions only where a compatibility change occurred. This page was last edited on 23 January 2018, at 03:20.